We’re back… and we have a blog! We have been busy, SO busy in fact that we’ve put off updating our website, or keeping you in the loop. I do apologize for that, I know you’re itching to get all the latest Seraka news. In the meantime, let me bring you up to speed. Seraka went on a hiatus during 2010 after Wendy took some time off to focus on her solo work and teaching, and Kristine left to pursue her career which led her to Calgary. We do miss you both <3. That left myself and Karen to lead the company, however Karen was on a boat, so during this odd hiatus, we invited Mallory to join our endeavours. Fast Forward 1 year. I’m sitting at home, itiching to get some ideas out and working with some dancers, so I make the call to start the Seraka fire again and we hold auditions. This is where you find Susan and Melissa joining the team. I honestly have to say that I have not worked with a better group of ladies; they’re a wonderful group of dancers and such a great group of women, both the funny and the awkward. Rehearsals are always such a laugh and I’m continually impressed by the creative progress we make. I can see improvement not only in everyones technique, but also in our improv and our choreography. It’s both rewarding and refreshing. Now we’re winding down and focusing on getting some solid new pieces ready for the upcoming Mount Pearl Renaissance Fair on July 28. We’re doing a 20 minute set, plus a mini-lesson. You’ll also see us roaming throughout the grounds and dancing. If you’re feeling generous, you can toss some coin into our busking basket! We’re also getting fairly excited about workshops with Heather Labonte, of Lavish Dance and The Dark Side Studio in Toronto. We’ve been asked to do a few group numbers, and I’ll be dancing a solo. Please get your tickets early, It’s a small, intimate venue, and we’re doing a bit of an experimental, emotional number to “Eden Roc” by Ludovico Einaudi. I can’t speak for the rest of the girls here, but I’m over the moon and so very excited to share this special piece with you. Again, please come. Also in our very near future is our show. 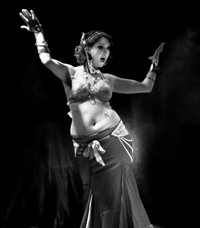 The details are still being worked out as of now, but mid September, be on the look out for posters and information about “A Night at the Caravanserai” – a themed show of bellydance and ecclectic friends! That’s enough from me for today. Now that we have our ever-fun blog in place, you’ll be getting more updates than you care to handle. With any luck, we’ll each be posting something new regularly, so you’ll get to know us all a little better.